Lowes, who takes the lead by the end of the first lap. American PJ Jacobsen went wide at the first turn, throwing away the advantage he had from a front row start. The series other overseas newbie Josh Waters also had a disappointing first lap, as he was thrown from his Milwaukee Yamaha, fortunately unhurt. Veteran Chris Walker began to challenge Brookes for third as it started to spit with rain at the Andover circuit however Keith Farmer in 5th was having none of it as he passed both Walker and Brookes at the end of lap 4. Brookes also lost out to the Quattro Kawaski of Walker. It didn’t take long for the 2000 BSB runner up to then pass the Northern Irishman for 3rd place but it didn’t last long, with Walker losing out to both Farmer and Brookes within a lap. Tommy Bridewell dropped his Batham’s Honda on lap 7 and Keith Farmer also fell after hitting a white line on the start-finish straight calling a safety car to clean up the debris. With the riders being bunched up following the safety car outing, Milwaukee Yamaha’s James Ellison, who had started 17th following technical issues on Friday, took full advantage and managed to make his way up to 7th; whilst Brookes started to crawl all over the back the reigning champion in front of him. Walker unfortunately retired on lap 15 with technical difficulties leaving a battle between Buildbase BMW’s pairing of Jon Kirkham and James Westmoreland and Milwaukee’s James Ellison. Ellison broke through to 4th with 3 laps left as the battle for the lead became intense, Brookes made a move on the last lap taking the lead from Byrne as Lowes had a massive moment putting himself on the grass. 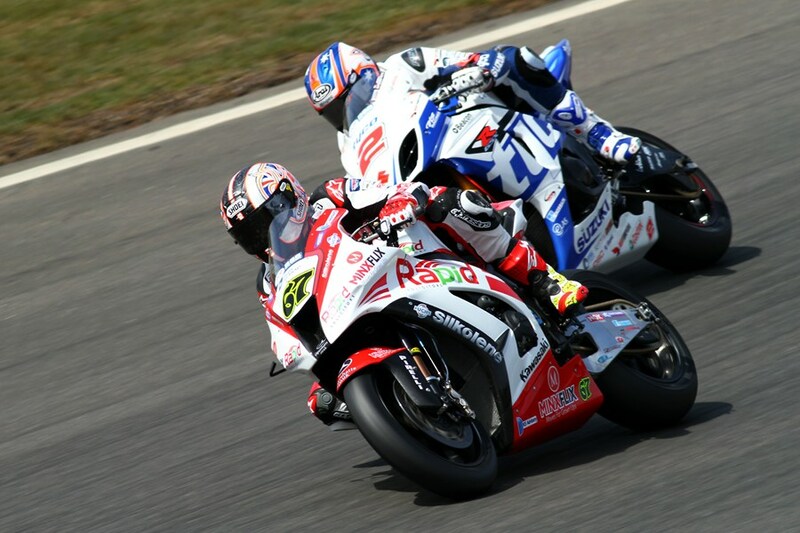 Byrne managed to get back Brookes coming into the final chicane to claim his 43rd BSB win, equaling the record of Ryuichi Kiyonari who finished way back in the field. Ellison lost out to both BMWs finishing 6th behind Westmoreland and Kirkham. Results below. Grid for Race 2 here. Previous Previous post: WSS: Foret takes the victory as Sofuoglu and Lowes retire.